for the second week running. It took extra time to separate Galway and Shannon Blues one week following their close encounter. Once again it was tremendusly exciting affair. The game was fast, the teams moved the ball well, and it followed a similar storyline to the previous one last weekend. The Blues looked like they had the game in the back, only for Galway to rally late and this time, force extra time. The winning score was again a free, this time from Kevin Cummins. The Blues started brightly, Andy Glennon was again on the mark early. Shane Cavanagh added a couple for the Blues, but Galway kept the game in hand with scores from Jamie Kehoe, Danny Reddin, and Cummins. The Blues put some distance between themselves and their opponents with some good second half football. The Blues attacked in waves and put the ball wide of the posts several time before finding the spot between the posts. Cavanagh was again on the mark, and with time running out the Blues had a 4 point lead. Galway put four in a row over the bar to tie it up. Two free kicks from Cummins, one from play and a Kehoe point meant added time would be needed. Each side goaled in the extra period. Galway first through Reddin after some great work by Cummins and the Blues through Anton McDermott. Cummins was the man again for the westerners with a point from a sideline and what proved to be the winner from a free kick about 40 yards out. Galway advance to meet Aidan McAnespies in the semi-final which will be played Wednesday night at 5:30. It was back to earth for Cork when they met a strong Wolfe Tones side in the other quarter final one Sunday. Cork conceded a lot in size and strength as the Tones did not mess around in putting the game away early. At the break the Cup champions held the rebels scoreless while running up an eight point tally. It was more of the same in the second period. Cork managed a Mike Moynihan free, while the Tones continued to keep the scoreboard ticking over with scores from Marty Farrell, Danny Egan, and Dan McCAbe. The Tones meet Christopher's at 2:00 next Sunday in the semi-final. Shannon Blues were pipped in the last minute by a dogged Galway team that looked to have little hope with time running out in the contest. The Blues looked strong in the first half and pointed through Andy Glennon, Shane Kavanagh, and James Feeney. Playing tight at the back, the Blues offered Galway few scoring opportunities, and those that the Tribesmen managed to work proved fruitless. Galway lifted their efforts in the second period and gaps began to appear in the Blues rearguard. Jamie Kehoe fired a warning shot off the post from inside the box, and shortly afterwards Eoghan Kavanagh fielded a ball from JJ Doyle and fired home from close range. It was the turn of Martin O'Connell to rally to the Galway cause with a diving fingertip save from Shane Kavanagh after Glennon had pointed to give the Blues a three point lead. Simon Sinnott saved well from Kevin Cummins at the other end, but the leveler came from Danny Reddin as Galway's nimble forwards engineered openings. A last minute free that Doyle popped over proved the winning score. Galway advance to the quarter finals, while the Blues meet the Gaels in the back door game Wednesday night. Christopher's pulled off an eyebrow raising win in their opening game of the season. Fielding a side that featured Gervase Toner, Ian Foley, Pat Delaney, the 3 Kenneally's, Chris Murphy, and Murt Hunt, Christopher's looked the fitter of the two teams and led from start to end. The first half saw Toner lively at corner forward. The Armagh native accouted for a brace of points and the lay off the Pat Delaney for the first goal. Donegal eventually got into the game and scores came from Christy Bell, Paul Boyce, and Pauric McLaughlin. Holding a 1-3 to 0-4 lead to get the second half going, the winners pressed home. Delaney fed off Toner once again for the second goal while Donegal sputtered. A late goal from Boyce proved some consolation, but Donegal's participation in the competition ended with the final whistle. Cork maintained their interest in the competition with a 1-6 to 0-3 "back door" win over Kerry. An early Mike Moynihan goal set Cork on their way, and further points from the goalscorer, Lar Barden, Colm Caffrey and John Crowley (2) left them 1-5 to 0-1 ahead at the break. Kerry enjoyed greater possession in the second half and added points through David Clifford and Ian Whelan. However, another point from Barden helped ease the Rebels to a six-point success. Aidan McAnespie's got their season off to a winning start over Donegal with two late goals as Gaelic football action returned to the fields of Canton on Sunday. The two senior clubs were pitted against each other in the first round of the Pat O'Brien Cup, and Macs' strong finish saw them progress on a 2-3 to 0-5 scoreline. Gareth O'Neill, who had also been in action the night before, boxing at the Battle at the Bay #2, was to the fore for the Macs. Playing at full forward, O'Neill pointed twice, and Paul Boyce answered with one for Donegal, who faced a strong wind, into a 0-3 to 0-01 half-time lead. There was little between the teams for most of the second half, and two converted frees from Boyce had Donegal leading by 0-05 to 0-3 heading into the closing stages. But that's when Macs struck as a long-range effort from O'Neill dipped just over the despairing hands of Donegal goalkeeper Gareth Ruddy and into the net. Within 60 seconds the winners were at it again, as Timmy McKenna collected another long ball into the danger area before applying a clinical finish. With cup games being played over 40 rather than 60 minutes, there was no time for Donegal to recover before the final whistle was blown. Earlier, Wolfe Tones recorded a 2-10 to 3-2 win over Cork in a challenge game after the latter side were unable to field a full complement of 13 players. John Crowley (2) and Michael Moynihan from the penalty spot were among the goals for Cork. Wolf Tones' superior fitness told in the end, however, and they were greatly helped by the personal tally of 2-4 racked up by full-forward Danny Egan. Thanks to Seamus Leonard for the reports. Anybody reading from near and far will also, I'm sure, be aware of and have seen on television the events that took place on Monday at the Boston Marathon. It truly caught us all by surprise. Boston has become very much a home away from home for people like myself who came from Ireland almost 20 years ago and more recent arrivals to the Boston area. Many friends, some who were involved with the GAA and some who were not, were in the area when the bombs went off. Our hearts go out to the victims and their families, those who died and who were injured. The marathon is very much a day for families and people who run the race for causes that save or improve lives, these are the ones who were there and crossing the line at the time. Boston is a great city and will come out of this tragedy even stronger than before. 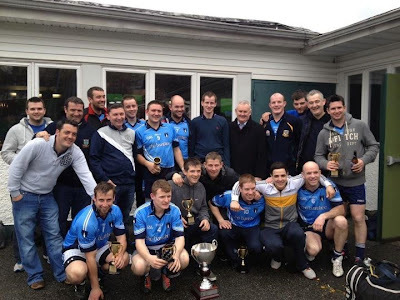 Wolfe Tones and Connemara Gaels made the 200 mile journey to New York to compete in the John Joe Cassidy Seven a Side. It was an exciting competitive tournament with lots of action and some strong opposition for the Boston boys to take on. The Tones traveled as defending holders and were pipped in the final by a very strong Cork outfit from New York. The Tones brought a strong side that feature a handful of newly registered players. Dubliner Johnny Kelly and Clane men Danny Egan and Craig Gartland togged out in the Blue and Navy for the first time. The Tones had chances to make sure that they would not have to hand over the cup, but came up just short in the final. The Boston outfit were placed in group with fellow Bostonians, Connemara Gaels, as well as Cavan NY juniors, Cork NY, and Young Irelands Philadelphia. The Tones made it through in second place behind Cork NY, having beaten the other teams in their group. The Tones drew Kerry NY, who won the other section, in the semi-final and just about shaded it with a one point victory. The Tones led by a point in the late stages, but Kerry had a last minute chance to win it. Barry McShea played hero as the Mayo man saved a penalty to preserve the lead, and the Tones were in the final for the second year running. There they met the New York Cork club. It was almost a reversal of fortunes from the semi-final as it was the Tones looking to make up the one point deficit in the final minutes, but Danny Egan had a chance and went for the win, but his shot hit the side netting. The Connemara Gaels, who left Adams Village at 6:00 Sunday morning, faced a Cork NY in their first game suffered a heavy defeat. The Boston side fared much better in the next two games, though the Connemara men felt hard done by in their game against Young Irelanders. Three disputed point calls did not go their way and the Gaels lost on the score sheet. The final game against the Tones went to the wire. The Gaels led by a point in the latter stages only to give away a goal and end up on the losing side by one point, but unfortunately did not do enough to progress. Players who traveled to New York were: Wolfe Tones - Johnny Kelly, Gavin Walsh, Danny Egan, Craig Gartland, Cormac Joyce-Power, Mike O'Brien, Barry McShea, Gary Brilly, Collie Carr, Marty Farrell, Keith Gill, and Cormac Moran. Connemara Gaels - Chris Lafferty, Kevin Owens, Jack Purcell, AJ Maguire, Noel Graham, Damien Doolan, Coleman Mulkerrins, Pat McDonnell, - Guest players for the Gaels were Pat Murray, Derek O'Brien, and Sean Manley. The long winter is over! The 2013 Boston GAA season at the Irish Cultural Center in Canton begins on Sunday, April 14 with the first round of the Pat O’Brien Cup. The first round games will feature the holders, Wolfe Tones who will play Cork, Galway meet senior champions Shannon Blues, and Aidan McAnespies will play last year’s beaten finalists, Donegal. There will be a back door system where the first round losers will play again. Kerry, Christopher’s, and the Connemara Gaels are already into the quarter-finals. This year will also see revamped senior and junior football competitions. The senior football championship will consist of 8 teams. The junior football championship will feature three sections. Junior A1 and Junior A2 will each have 6 teams, and there will be a smaller Junior B championship. Also, there are three teams traveling to New York this weekend for the John Joe Cassidy 7-a-side football competition which marks the beginning of the New York Championship. Wolfe Tones, the only non-New York Based club to win will be defending the title they won last year. Also traveling are Cork and Connemara Gaels. Best of luck to all three teams.